In the United Kingdom the use of open fire has been a popular choice for property owners. The use of open fire has been the common choice in heating the properties. However, this type of tradition has been flawed as it has meant the heat from the fire place is not distributed evenly across the room of the property. This has lead to the heat being trapped in certain portions of the property. Furthermore, most of the heat from the open fireplace has found a way to escape the property by the chimney. This uneven distribution of the heat marked a flawed heating system for the property and meant a certain portion of the property was more heated then other parts of the property. The aim is to rectify the problem as much as possible and to find a solution which would help with heating the property and distributing the heat properly within the property. Thus with the introduction of the wood burning stoves it has meant to a more equal distribution of the heat within the property. One of the main advantages of the wood burning stoves is it does not need the aid of air for combustion and helps to improve the efficiency ratings of the property. Furthermore, with more of the heat staying in the property it has meant the rooms in the property would get heated faster and the heat would stay in the property which would make it a better choice. This is a very good choice as the climate is mild and cold for most part of the year. Furthermore there are fans designed to help wood stoves to accelerate the process of distrusting the heat in the house and make the property warmer. However consideration must been given as to what type of property wood stoves would be best suited for the property and it is commonly thought if the property is very well insulated the wood stoves would work at their best. The other aspect to note is there is a requirement for regularly supply of wooded logs to the stoves to keep them burning and this can become a problem as it would mean there is a need to keep attendance to the stove. It is essential to consider in the event of using wood stoves there is a likelihood of the property become more efficient. 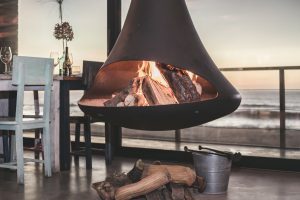 The costs associated of having a wood stove need to take into consideration the cost of installation and other building costs. The aim should be to help to reduce the costs in the long of having a wood stove by the reduction of the heating needed for the property. This would help to save money on heating costs. However it is important to note any type of installation work carried out in the property must comply with the building regulations. There is a need to always use a qualified fitter to ensure all the work is carried out to a sufficient standard of safety.